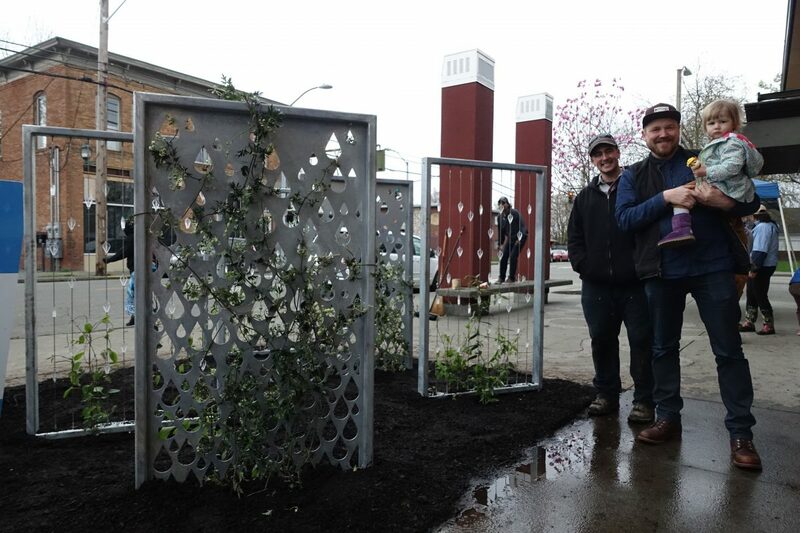 On April 8, JHA and its partners inaugurated the installation of seven artistic green wall panels at the South Park Library. 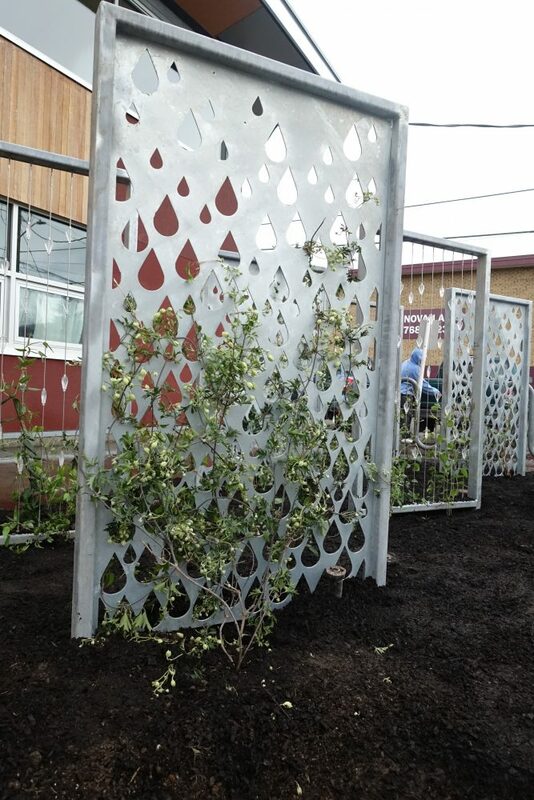 The panels, each 3 feet wide by 5 feet tall create a free standing vegetated trellis system. 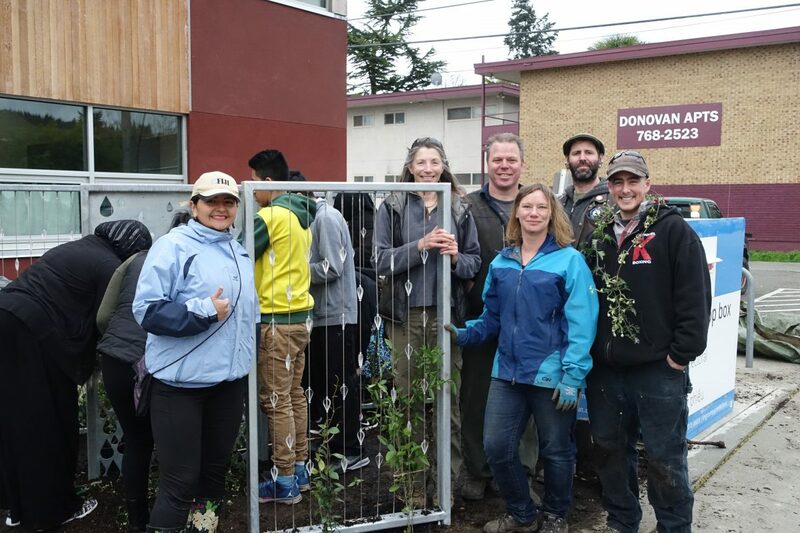 Duwamish River Cleanup Coalition’s (DRCC) Duwamish Valley Youth Corps (DVYC) helped spread mulch and plant vines around each panel. When fully grown in, these panels of green leaves will filter the particulates passing through them and absorb air pollution. South Park has some of the worst air pollution in the city of Seattle, as well as the highest hospitalization rates for childhood asthma. The South Park residents have continually prioritized air pollution as their biggest concern, and asked JHA and DRCC to address this concern with actionable projects that will make an impact on their health and daily environment. 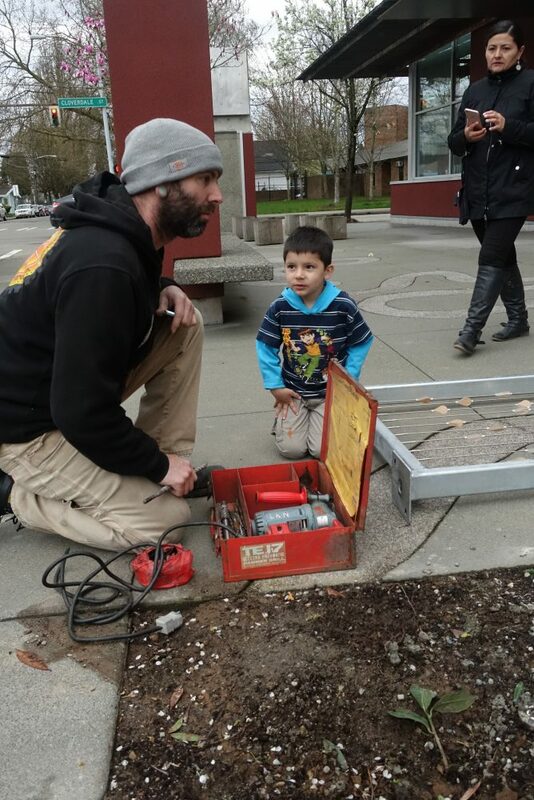 The community chose the South Park library as the location for its first green wall for multiple factors including its highly visible location, its proximity to Highway 509 and S. Cloverdale Street, and because it’s the perfect venue to educate community members about a green wall’s potential to reduce air pollution. Community members and the DVYC were involved throughout the project including siting, panel design, and plant selection. 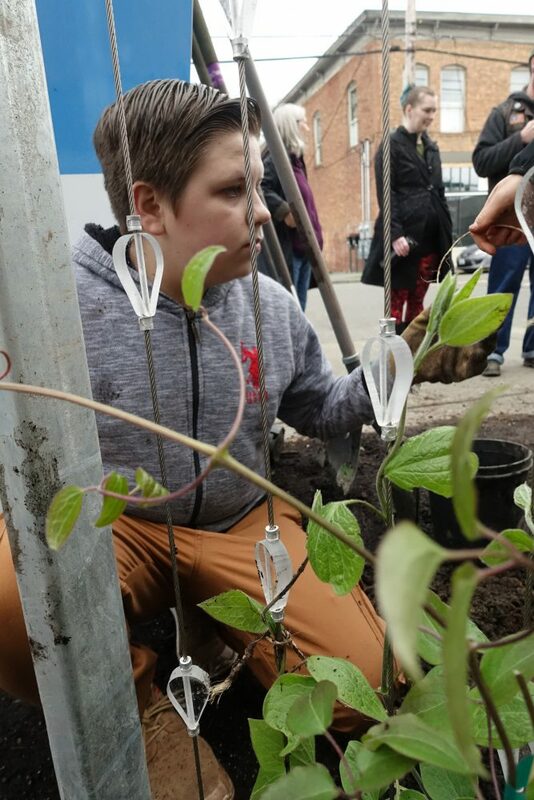 The DVYC planted all of the vines on inauguration day. 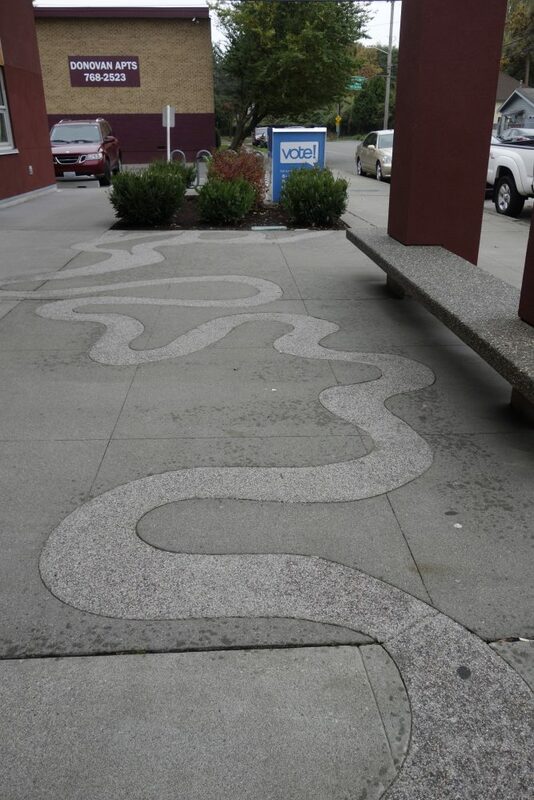 The concrete pavement design in front of the library represents the original, meandering Duwamish River before it was straightened by the Army Corps of Engineers from 1913-1920. The concrete river “empties” into a metaphorical estuary, an 18 x 12 foot area that was formerly planted with laurel bushes. Michael Lewis (above) of Bellwether Design was inspired by an evapotranspiration theme for the panels’ design. Evapotranspiration is a continuous process where water cycles from land to the atmosphere from soils and plants. There are two types of panels onsite: The first type is a sheet of metal with a cut out pattern of falling rain drops, representing the abundant rain we get here in Seattle. The second type is called a cable trellis, with upside-down rain drops made of clear acrylic strung on the cables, and representing water evapotranspiring back into the atmosphere with the help of the plants. Of course, the vines purify the air as well. 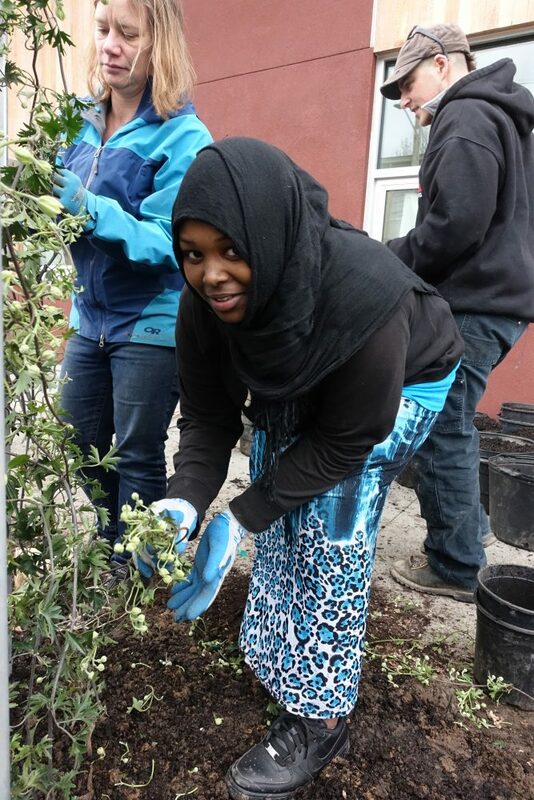 South Park Community and the Duwamish Valley Youth Corps: It is such a privilege to learn from the both the community and the South Park youth about their vision and ideas about what they want their community to look like. Paulina Lopez, you continue to inspire us every day with your intelligence, great sense of humor, and amazing dedication to your community. 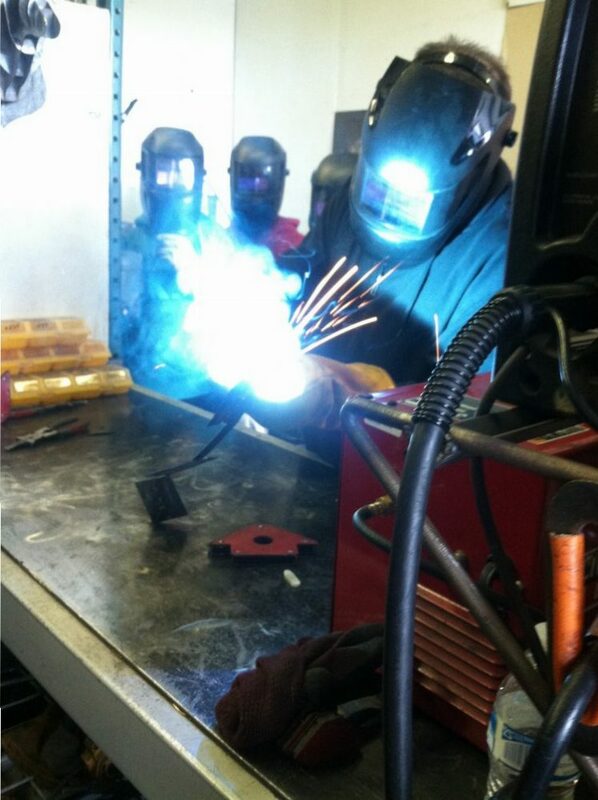 The panels were built locally at South Park’s Hazard Factory with the awesome help of Rusty Oliver. The DVYC got to visit the Hazard Factory one afternoon to learn about how the panels were made and take a welding class taught by Rusty. In response to the residents’ request to have year-round color and pleasant scents, Roseann Barnhill of Aster Rosa Designs came up with a plant design including multiple varieties of Clematis, Honeysuckle, Jasmine, and a ‘Summer Jazz’ Trumpet Vine. This combination of evergreen and deciduous vines will ensure that the panels are covered in green all year, with flowers blooming in every season. Andrew Schiffer (above) ran this project from beginning to end with incredible dedication ranging from communicating with library staff; teaching the Duwamish Valley Youth Corps about air pollution; welding at the Hazard Factory; hanging the acrylic raindrops on the cables; digging holes and pouring concrete; buying the plants; and many more things. Ethan Newstrum, union carpenter and concrete expert extraordinaire, showed up the day before the inauguration and saved our project once again at the very last minute. Just before he arrived, we discovered that four of our concrete footings had failed to set, and were not safe to build on. 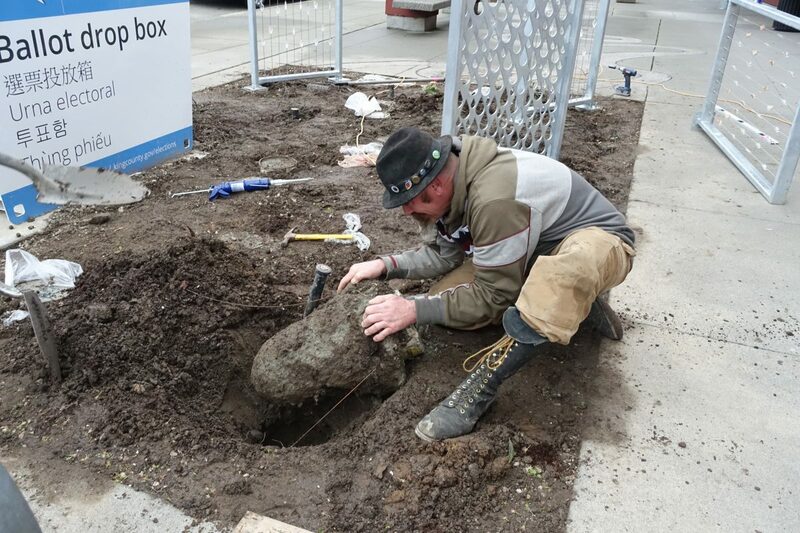 With the assistance of Jess Bacon, Ethan came up with a quick and safe solution, helped us dig up the failed footings, and stayed to install replacement footings, all in the middle of an epic rain and wind storm no less. 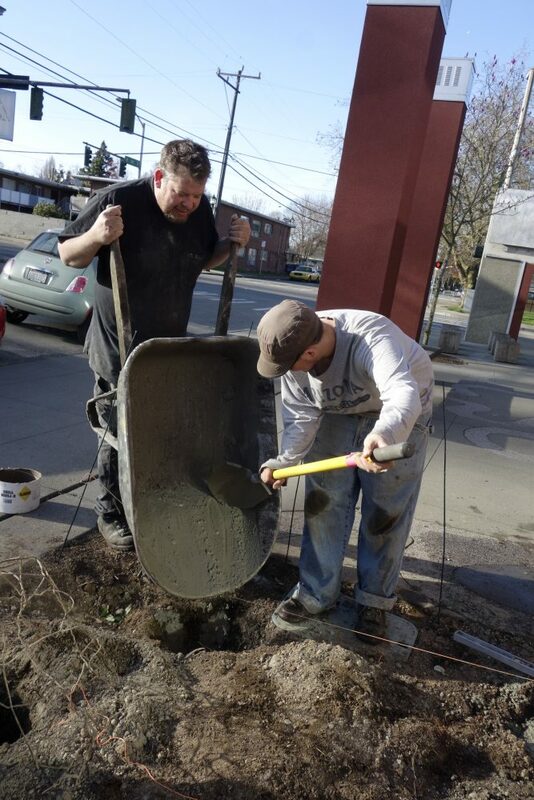 Joshua Piper of Good Earth Plantings helped us prepare the site for installation by doing all the math to lay out the panel footings and dig the holes in the proper locations, digging out the bushes previously on site, and pouring the concrete footings. Zak ‘Deacon’ Scott assisted with installing the panels in the footings and problem solving. Thanks to the library for allowing us to do this on your property. Thank you especially : Jay Donahue, Lupine Miller, Daniel Pestana, and Dennis Reddinger. 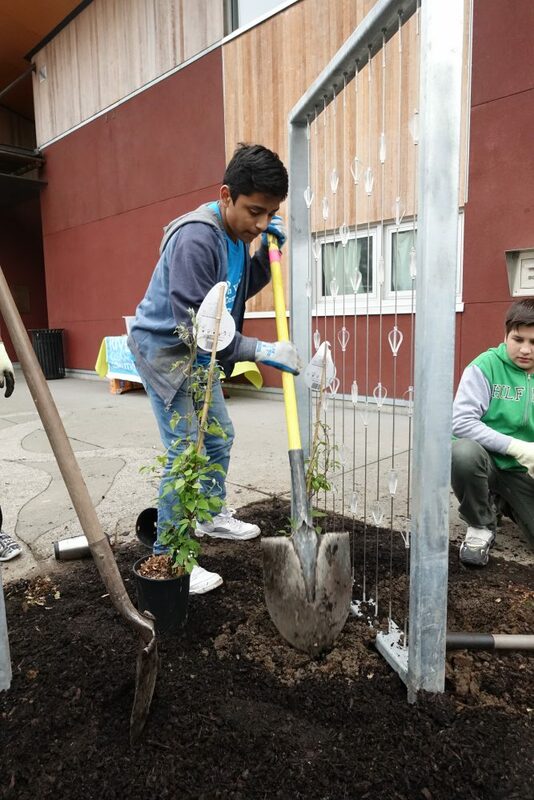 Thanks also to our funders: Duwamish River Cleanup Coalition through an EPA Environmental Justice Problem Solving Agreement; the Seattle Parks Foundation through the City of Seattle, Department of Neighborhoods Duwamish River Opportunity Fund; and a King County Green Grant given to JHA. Listen to the interview on inauguration day by Martha Baskin at Free Speech Radio News.